Mayor Bill de Blasio and the city's Security Infrastructure Working Group announced plans to bring permanent perimeter barriers, or bollards, to high-profile sites and to create a process to streamline their design and construction. 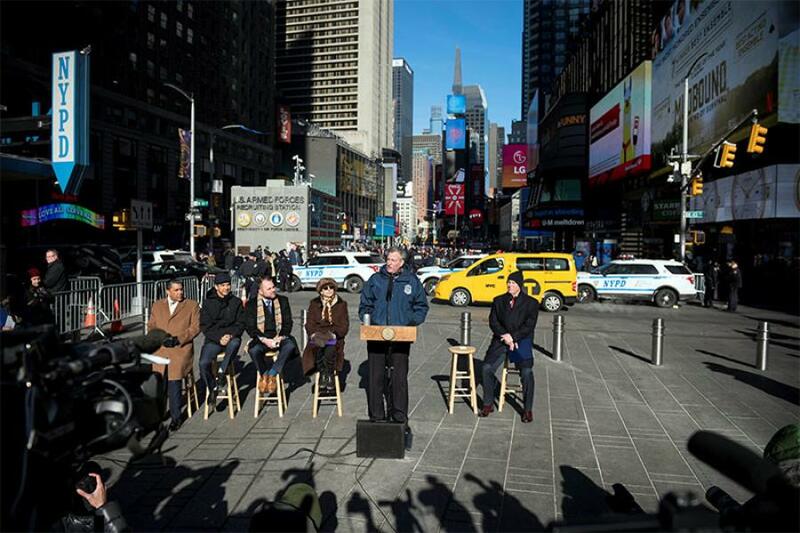 The Administration plans to double its $7.5 million commitment in the September Capital Plan for permanent bollards in Times Square, and will commit in excess of $50 million to commence the broader rollout of new protective measures in public spaces, including 1,500 new bollards as part of an initial installation phase. In 2017, the City Council passed legislation requiring DOT and Parks to report on the number of bollards installed annually and the number of revocable permits granted annually to private businesses to install bollards. In the wake of attacks around New York City in 2017, protective concrete barriers were installed at high profile locations in Manhattan. These temporary structures will be replaced by more attractive temporary blocks in advance of the rollout of the permanent metal bollard installation beginning this March. The installation of these permanent structures will be completed over the next few years. As they are replaced with permanent security structures the new, more aesthetically pleasing blocks, will be relocated to other locations identified as high profile. In identifying locations, the city conducted a thorough review of locations, including business corridors, tourist attractions and iconic sites, resulting in the prioritization of key locations in the city to be addressed with permanent fixtures under this plan. The city previously installed permanent metal bollards near the Times Square pedestrian plazas as part of a $50 million capital project completed in late 2016, and similar bollards will be added to additional areas in Times Square as part of this project. The Security Infrastructure Working Group, currently comprised of the Mayor's Office, New York Police Department, Department of Transportation, the Department of Design and Construction, Public Design Commission, Department of City Planning, Department of Environmental Protection, Fire Department of New York, Department of Parks and Recreation, Office of Management and Budget will streamline the bollard design and construction by coordinating with the agencies responsible for reviewing and approving bollard installations to conduct their reviews as concurrently as possible. The installation process for these structures includes procurement protocols and engineering reviews normally associated with capital work. For years the city, through DOT and NYPD, has worked closely with private landowners and institutions on security measures through the revocable consent process, allowing bollards or other security structures to be installed on sidewalks. NYC DOT has approved dozens of locations for such structures, which are paid for by the property owners. The city looks forward to continue its partnership with the State, the Metropolitan Transportation Authority, the Port Authority and other entities to bring and facilitate protections on properties within the five boroughs, such as alongside the West Side Greenway.